"He was a man, once great in wealth, a lord of house and lands, until he fell into Love's arms, but more into her hands." from the accompanying poem for my painting "Love's Fool"
I grew up in Austin, Texas and spent a lot of time at the creek behind our house learning about the nature that surrounded me. I consider those years my ‘Tom Sawyer’ education. 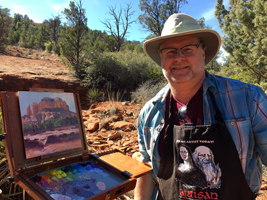 Greatly influenced by that time, I began my college years majoring in biology and geology until a severe mid-1980’s decline in the oil market encouraged me to turn away from geology and toward my other passion, art. I received a BA in Art from the University of Texas (Austin) in 1985, with a concentration in the areas of Commercial Design and Illustration. While having extensive experience in water-based media through my commercial work, I prefer to paint in oils, drawing from nature, history and travel experiences. I paint both in my studio and en plein air (outside in open air). I love to paint large formats but also have developed an addiction to painting miniatures. I like to think of the miniatures as art concentrate. My studio work usually begins as flash images or ideas but I often spend a fair amount of time studying a particular subject. I love to learn and during this research process I sometimes discover previously unknown features that become important to me in the final plan for a painting. Then the challenge comes. The ‘Illustrator’ in me is concerned with rendering while the ‘Artist’ needs to allow for discovery. I try to remain aware of the elements of design, mood and aesthetics in the initial stages of a piece but once the process of painting begins in earnest, I try to take the journey that the painting leads me on. I never pass up an opportunity to visit an art museum, gallery or art show to examine technique, study color and consider style. I believe every artist should find a muse and hone his or her craft. History, past and present, provides us with a rich diversity in art. When I feel that my muse is hiding from me, I am always inspired by those visual historians who came before and left behind something to admire. Below are some of the projects that I have currated or co-currated recently. Click on the varioust project logos below to go to their information pages. "Biologique" is a new exhibition that I co-curated with the New Mexico Art League. Read the review in the Albuquerque Journal. Natural design is a source of infinite variety and form. It can follow complex patterns that can repeat, scale, and progress with incredible complexity and aesthetic beauty. Artists are often moved to capture the whims of Mother Nature and in the process of artistic discovery we have unearthed amazing constants such as the “Golden Mean”, the Fibonacci sequence, π (Pi), fractals, and mathematical harmony. Nature can display these in the form of storms, erosion, trees, flowers, shells, feathers, and endless other ways. Artists may depict them, whether rooted in reality or imagination, through drawing, painting, photography, or other creative methods. In 2013, I began the Paint the Ballet cooperative arts project. Painters work with the New Mexico Ballet Company to paint the subject of ballet. Click Paint the Ballet above to see more about this unique project.